It’s here! The week of Valentine’s Day and let me start by saying, or if you’ve been here a while you already know, I love any good excuse to celebrate something! Whether something small or on a bigger scale, I just love a good party or celebration. Valentine’s Day is clearly my favorite. Even when I was single. I mean… a day of love and chocolate? Who cares if Hallmark made it, I’m in! Along with my new hobby of DIY homemade cards. In preparation for Saturday, all of my friends and family are getting truffle gift bags, because there are just THAT good. I like rolling them in cocoa powder, but unsweetened coconut is delicious as well. Roll them sprinkles for an even more festive treat for those who aren’t super clean eaters! One or two truffles are the perfect way to satisfy that chocolate craving. Rich, chocolatey perfection! Disclosure: This is a sponsored post with Young Living Essential Oils. I was compensated for the time spent developing this recipe. All opinions expressed on Lexi’s Clean Kitchen are 100% always my own. My sponsors help make this blog possible! These look soooooo good!! I love vegan truffles, and such a good idea for valentines . . .
Any suggestions on packaging these for the mail so that they hold? I know it’s a late reply, but I’d cover the truffles with tempered chocolate if I was to send them by mail. when you temper chocolate (lots of tutorials on Youtube), it solidifies back to it’s original state, and stays that way. So you’d have a nice little protective (and delicious!) shell around each truffle. I don’t know if these would make it to my friends if I were to make them for them! Perfect, Lexi! What kind of dark chocolate did you use? YUM. Wow. These look SO GOOD! I definitely want to make these this week. 🙂 Perfect for Valentine’s day! These look so rich and decadent. I can’t get enough chocolate and coconut…can’t wait to try! I finish my Whole30 on Wednesday. These are SO happening this week. Happy V-day to me!! These look incredible Lexi!!! I would make them for my other half. My stomach. this looks amazing and perfect for Valentine’s Day . Are you using unsweetened cocoa powder and would unsweetened cacao powder work? If not how can I make it sweet and still keep it Paleo friendly …coconut sugar maybe ? It is paleo-friendly. I use unsweetened cocoa powder. Cacao will give it a different taste but will work. Do you think these travel well? Being out of a refrigerator for around 1.5 hours? 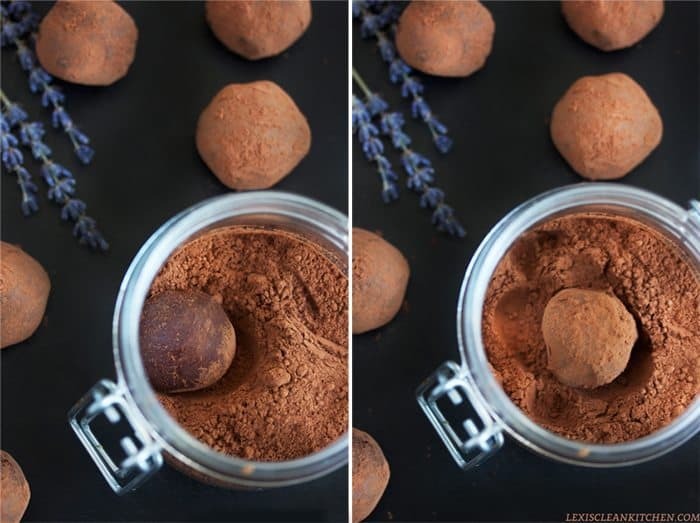 Lexi, these paleo truffles look so scrumptious yet so healthy! I’m a huge fan of unsweetened cocoa and would love to try this soon! 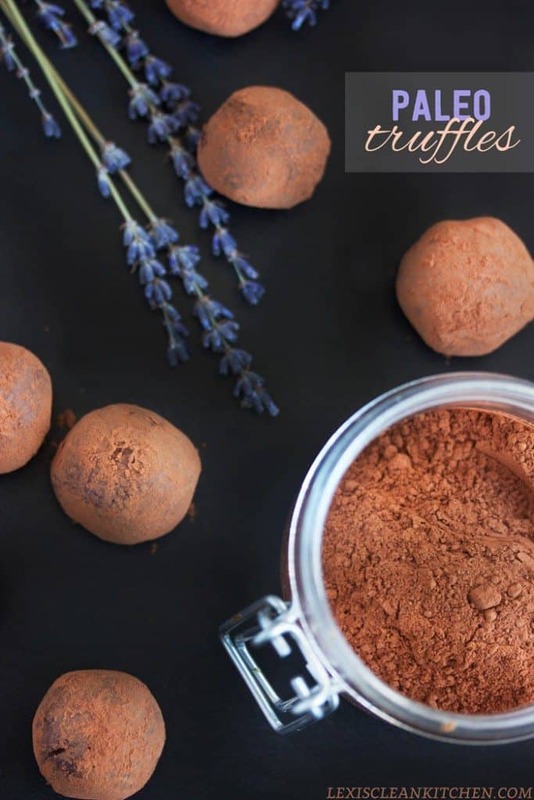 What beautiful and easy truffles! I love the addition of lavender here. So perfect for Valentine’s. I love the idea of using coconut milk to make these! 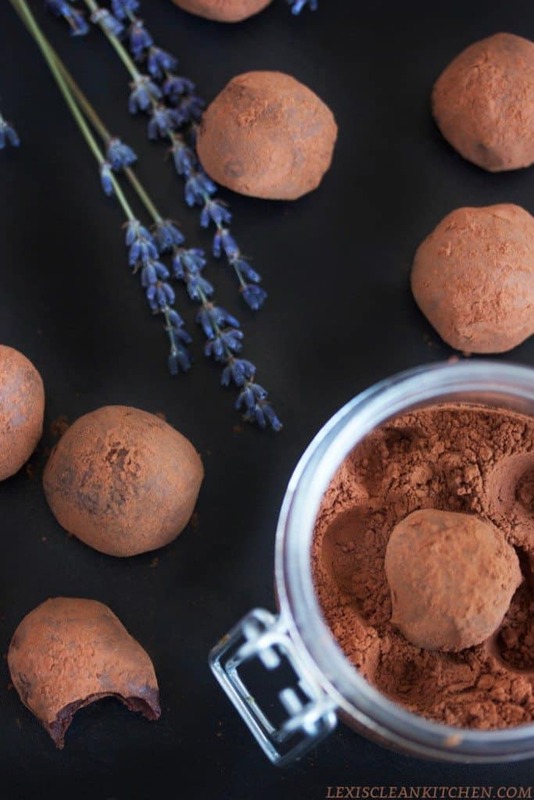 I never thought about making my own chocolate truffles, but these look delish! These look amazing. Can you leave out the espresso? They look so beautiful! Would the recipe work for 100% dark chocolate or would that be too bitter? Could you use Lavender Flower Buds (for baking) for this recipe instead? I’m sure you can, I have not so I can’t promise the same taste. So happy you like them! Frozen I’d say a month. Make sure you bring them to room temperature for serving! I do not like the flavour of coffee can you use something besides the espresso powder? It doesn’t taste like coffee– just helps with flavor, but you can leave it out. These look delish! What type of dark chocolate did you use? Did you follow the directions exactly? They are truffles so traditionally won’t be hard, but definitely not soft where you can’t lift them!